The Purse and the Boots. Seriously, she makes it look so freak’n easy right? Spelly and I could spend hours thinking of cool, gorgeous locations for little mico-shoots… and then there’s Ashely (Purse n’ Boots) who can stand in front of a white wall or a barbed wire fence and look like she’s caught in the lens’s crossfire at a RUSSH photoshoot?! Maybe it has something to do with her partner in crime, super talented fashion photographer Zoey Grossman who captures the boots in action! So stoked to see her rock’n out our Spell Bone & Tassel Bag. Holey F. Bloody amazing. I now need your bag – ten times as bad as before. that's one amazing bag – love it in this lighter shade! Wow, loving absolutely everything about this outfit and the photos are gorgeous! when are you getting in new items online? Purse n' Boots never fails to look amazing! Love her blog. + the bag looks gorgeous! This outfit is AWESOME!!! I´m totally into that style! I like that she is photographed in front of that fence since it reminds me of the net in a dream catcher. She's so effortlessly stylish and I'm in love with that bag!!! Um, wowza. Has that girl got some swagger or what? Love this! FIERCE!!! Seriously she doesn't even need to do anything much… whether she's smiling or not she's ROCKIN' IT!!! 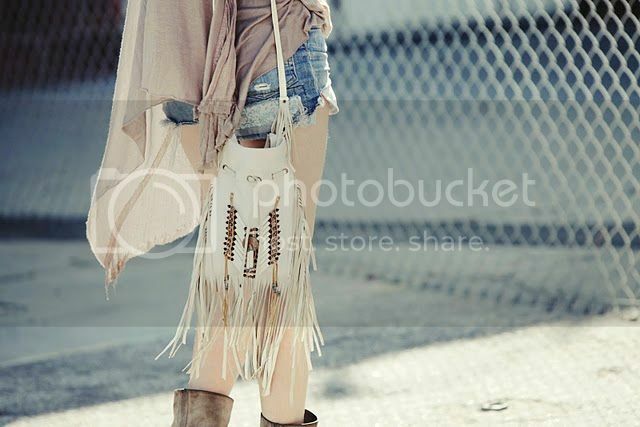 Of course the tassel bag helps a lotttt ;) and I”m wondering… where is her slouchy asymmetrical top from?? when I grow up I want to be like this beautiful girl!